Three years ago, Burnley suffered something of a hangover as they acclimatised back in the Championship after being relegated. There was a cloud over their start to the season, as they picked up two points out of the first nine available, and went out of the League Cup at Port Vale. We know how that ended - Burnley went from fifth at the turn of the year, to Championship winners on the back of a 23-game unbeaten run. 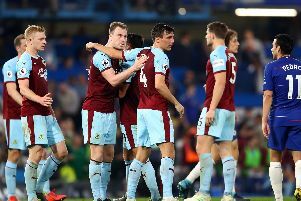 This year, on the back of qualifying for the Europa League, and the qualifying games which followed, the Clarets have claimed one point from 15, which is their poorest top flight return since 1927/28. Dyche likened it to a “fog” rather than a cloud this time round, but is confident the mist will clear if Burnley continue to do the things which have served them so well in his time, and continue to learn. He said: “It’s an outside fog. The last time we had it was the build-up to the season after we came down, and there was an oddness, the players know what they’re doing but can’t quite find the rhythm. “I couldn’t think of a better word than fog, it’s sort of a hangover but there’s no hangover because we finished seventh in the Premier League. “Success is a really important thing to handle. To finish seventh is a big marker. That can bring a fog because there’s something new and different. Is Dyche relieved to have that underdog status again? : “It’s the history of the club. In the last five years, no one has said we are favourites for anything. “The second promotion, we were among the top favourites but not the out and out favourites. Inevitably, there is some frustration among sections of the support on social media, but, likewise when Saturday’s visitors Bournemouth lost their first four games last season, there was a sense of perspective from within the club, which isn’t always the case at this level: “It’s an individual thing for clubs, I've never judge other clubs or managers. “This club does what it does, it’s difficult. I’ve said 5,000 times it's difficult, we wanted more players in, very difficult financially. “We’ve had that before, it’s not a new thing, They’re just facts. It’s not about trying to change the story, behind that look at what we’ve got, some very good players. They haven’t performed yet as a collective, but that’s a very good group of players, I believe in all of them. “Even very good players can have spells when it's tough, that’s what it is, coming out of that and working to come out of it, not just waiting. “We have to go and fight and work. Weirdly all of a sudden we’re underdogs, that’s because we didn’t win enough games in the early part of the season. “We’ve had the noise before, that’s not new to the players. “It gives you a better understands, a more balanced understanding. It doesn’t guarantee you come out of it, we have to earn that right. What would help is Burnley scoring the first goal, which they have failed to do in the league this season. Last term, when they scored the first goal, the only points they dropped where at Anfield, Old Trafford, and at home to Southampton and Bournemouth, on the final day.